Picturesque Bottle Cove is nestled away at the end of Humber Arm near Lark Harbour, Newfoundland along with the town of Little Port. Bottle Cove is nicely tucked away at the end of Humber Arm in Newfoundland, Canada surrounded by rocks that have been around since the last ice age. 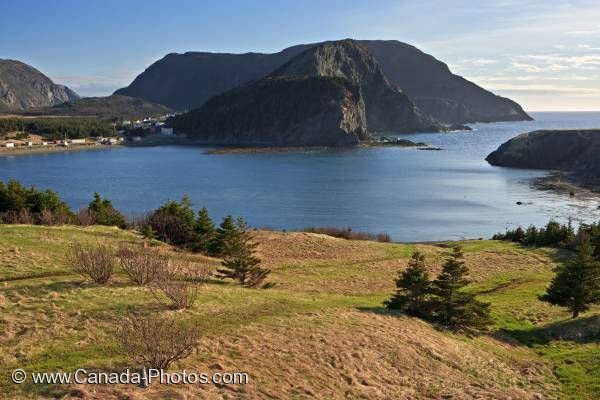 From atop the grassy field looking across Bottle Cove you will see the small town of Little Port hidden behind the large rock formations. Picture of the town of Little Port along the banks of Bottle Cove at the end of Humber Arm in Newfoundland, Canada.